Birthplace : Sheepshead Bay, Brooklyn, U.S.
Larry David is an American actor, writer, comedian, and producer. He is best known as the co-creator (with Jerry Seinfeld), head writer and executive producer of the television series Seinfeld from 1989 to 1998, and for creating in 1999 the HBO series Curb Your Enthusiasm, a partially improvised sitcom in which he stars as a semi-fictionalized version of himself. David's work won him a Primetime Emmy Award for Outstanding Comedy Series in 1993. Formerly a standup comedian, David went into television comedy, writing and starring in ABC's Fridays, as well as writing briefly for Saturday Night Live. He has won two Primetime Emmy Awards as well as being voted by fellow comedians and comedy insiders as number 23 of the greatest comedy stars ever in a British poll to select The Comedian's Comedian. Larry David grew up in Sheepshead Bay, Brooklyn and attended Sheepshead Bay High School. Of his youth, he says, "I had a wonderful childhood, which is tough because it's hard to adjust to a miserable adulthood." Not a surprising quote from a man whose alter ego came to life in the form of George Costanza on the television series, "Seinfeld," which he co-created. After attending the University of Maryland, David embarked on a career as a stand-up comedian in 1974. That career was peppered with odd jobs, including cab driver, bra salesman, and private chauffeur. In 1979, he moved to Los Angeles when he was hired as a writer and performer on the late night comedy series "Fridays." The show lasted until 1982, at which point he moved back to New York and eventually landed a job as a writer for "Saturday Night Live." In 1983, he appeared in two films: Henry Jaglom's "Can She Bake a Cherry Pie?" and Lawrence Turman's "Second Thoughts". David also first teamed with Woody Allen in 1987 to play a small role in "Radio Days" (as a "communist neighbor") and then again in Allen's segment of the 1989 "New York Stories" anthology (as a theatre manager). A friend of Jerry Seinfeld since 1976 when the two were performing in comedy clubs, Seinfeld solicited David's advice in 1988 when he was asked to develop a show for NBC. The two came up with the idea for "Seinfeld," which debuted in 1989, and went on to become one of the most successful shows in television history. David occasionally appeared on the show, playing roles like New York Yankees owner George Steinbrenner. He was Emmy-nominated seven times for his writing on "Seinfeld", and won in 1993 for the now classic episode "The Contest". He also shared an Emmy that year for "Outstanding Comedy Series" (as well as sharing six other nominations). In addition, David won WGA awards for his work on "Seinfeld" in both 1994 and 1995. He left the show after serving as head writer and executive producer for seven seasons, but returned to write the series finale in 1998, two years later. After leaving "Seinfeld" in 1996, David wrote and directed the 1998 feature, "Sour Grapes", starring Steven Weber and Craig Bierko. In 1999, he received an "AFI Star Award" at the U.S. Comedy Arts Festival. Also in 1999, David wrote and starred in "Larry David: Curb Your Enthusiasm," a one-hour special for HBO, which spawned the critically acclaimed HBO series the following year. Six seasons of the show have aired on HBO between 2000 and 2007. David was nominated for a Golden Globe as Best Actor in a Musical or Comedy series three times (2003, 2005, and 2006) for his work on "Curb Your Enthusiasm". The show also received a Golden Globe award for Best Television Series, Musical, or Comedy in 2003. In addition, "Curb" has been Emmy-nominated for Outstanding Comedy Series four times, and in 2003, David was also nominated for Lead Actor in a Comedy series. In 2006, he received a WGA award for Best Comedy Series for his writing on "Curb" and was nominated again in 2007. Currently, he's shooting the seventh season of the show, slated to air in the fall of 2009. -Nominated for a Primetime Emmy Award for Outstanding Writing - Comedy Series for various episodes of Seinfeld from 19911994. - Won a Primetime Emmy Award for Outstanding Writing - Comedy Series for the Seinfeld episode, The Contest, in 1993. - Shared a Primetime Emmy Award for Outstanding Comedy Series for Seinfeld with co-creator, Jerry Seinfeld. -Voted by fellow comedians and comedy insiders as number 23 of the greatest comedy stars ever in a poll to select The Comedian's Comedian. 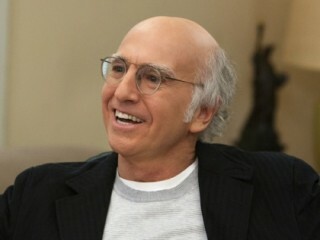 View the full website biography of Larry David.